It’s a fact that we’ve been so consumed by material things that we no longer value the truly meaningful things in the world. Material items give us temporary happiness. Things like a brand new car, a new television, a new phone, etc. Sure it’s nice to have nice shiny objects to show off and enjoy but ultimately and very soon these things become boring and we end up wanting something new a short while later. What’s been lost in humankind over the generations is the sense of gratitude. What we once fought for to survive, we now have without much effort. The essential stuff we need is easily available that we no longer value it as much. Now we value the things that really, on the grand scale, don’t matter all that much. This is a result of no longer appreciating the things we have and we’ve lost all sense of gratitude. It’s not a lost cause because gratitude can be adopted. It’s the way to live a happier and more peaceful life. In this guide which compliments The Gratitude Plan Video Course, you will discover how to change your mindset and how to appreciate the more basic things in life. You’ll also learn how to think more positively, how to employ meditation to gain a more appreciative attitude, how to be more generous and more giving towards others, how to change your whole life into something far more meaningful and much more. 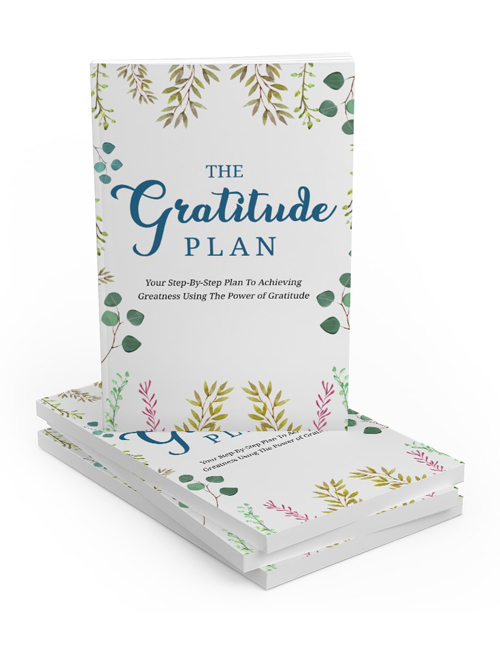 If you really want to learn how gratitude can be an incredible asset to your health and happiness, grab this guide now.